Inside Lacrosse ranks the LC men’s lacrosse team with a preseason eighth-place in the nation and doles out multiple personal accolades. Junior Joe Lisicky has been recognized as the Inside Lacrosse preseason Defenseman of the Year and selected as a preseason First-Team All-American. Senior attack Dylan Hoff, junior midfielder Max Voumard, and senior faceoff specialist Jeff Schwartz have all been recognized with preseason Second-Team All-American honors. Senior goalie Franc Cook earned a preseason spot on the Honorable Mention All-American team. Last season, Lisicky showed his ability to bottle up the other team’s best player while picking up 71 groundballs and adding 10 goals of his own. His exemplary play garnered him All-American Third Team honors as well as a spot on the Old Dominion Athletic Conference (ODAC) first team. On the offensive side of the ball, Hoff was recognized on the preseason All-American Second Team. 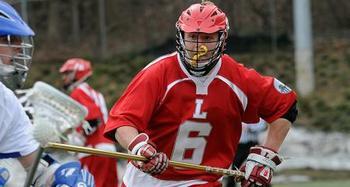 Hoff, who scored 37 goals in 2011, is only 55 points away from becoming Lynchburg’s all time leading point scorer. Voumard was recognized with a spot on the preseason All-American Second Team alongside Hoff. Schwartz was named to the preseason All-American Second Team, as a faceoff specialist. He earned All-ODAC First Team honors in2011. Cook was acknowledged with an honorable mention to the All-American list. An All-ODAC First Team goalie in 2011, Cook brings his near 60 percent save rate from 2011 to anchor a defense that gave up a stingy 7.2 goals a game last year. Under the leadership of 13 seniors, the men’s lacrosse team concluded one of the most successful fall semesters in recent years. The fall was highlighted by hosting a scrimmage with the NCAA Division I defending national champions, the University of Virginia; participating in a multitude of community service initiatives; and welcoming back 35 alumni to participate in the annual alumni game. The Hornets boast a 2012 schedule that includes nationally recognized teams as well as ODAC conference opponents such as Hampden-Sydney College, Washington & Lee University, and Roanoke College. The team begins the quest for an eighth ODAC Championship game appearance, a fourth ODAC title, and a sixth trip to the NCAA tournament with a home game against Birmingham Southern College on February 12.